Limited Edition of 300 Copies on Electric Blue Vinyl! At Tuff Kong Records they like to keep an eye out for up and coming artists, that hidden gem that can fit their catalog and blow your mind, and this is just the case. Nicolò Pandolfo aka Icon Curties is a young Italian beatmaker from Cagliari, Sardinia who started making some noise in 2012 with his first release "Quarti Marziali" as well as several collaborations with Italian MC's, and as 1/2 of the group Miles Dailies. 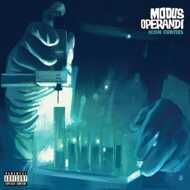 Some time ago he started reaching out to artists overseas and gathered a proper underground hip-hop army to deliver on his productions, the result of his grind is "Modus Operandi". A quick look at the tracklist and the names featured on this album will make you understand what you've got coming your way, with appearances by Daniel Son, Pounds, Lil Eto, Hus Kingpin, SmooVth among several others.